I am lucky enough to say I have eaten out at some of the best places and eaten some of the most amazing food throughout my time as a blogger, and as a young professional. Nobu, Zuma, The Kennels and more just to name a few plus pretty much everywhere in Southampton and a few in Winchester too. However, every now and then a brand new place jumps right to the top of the list and just stuns me. We were escorted there too, by local chauffeur company Amlyn Chauffeurs in the most beautiful Mercedes! The Ivy Winchester is part of The Ivy group of restaurants, with most in London that I have never been able to go to. 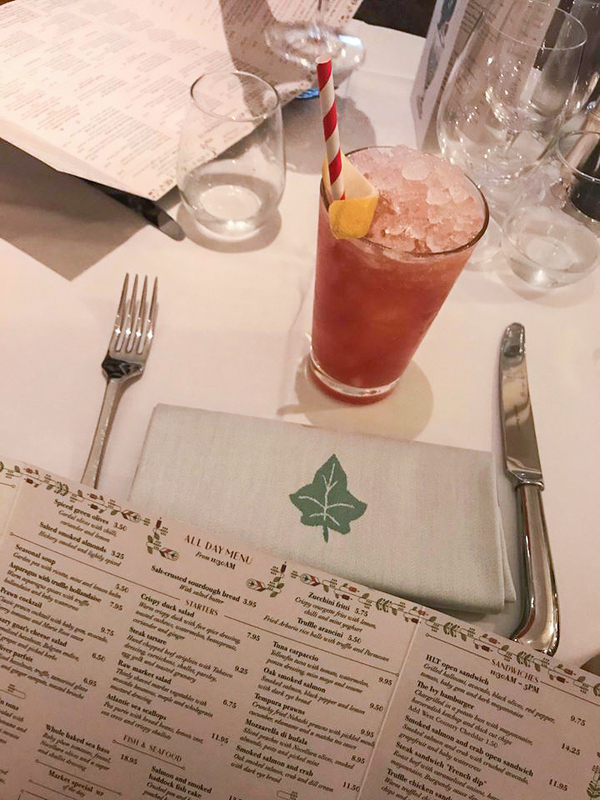 When I heard it was coming to Winchester I just knew that I would value that as a spot to drink cocktails and eat incredible food throughout the summer and beyond. But I didn't know it would be quite THIS impressive! This grand bar and restaurant in the heart of Winchester can accommodate approximately 150 covers and is quintessentially fitting with Winchesters heritage. The decorated interior was beautifully crafted by Martin Brudnizki Design and even though extremely royal, is comforting and welcoming at the same time. 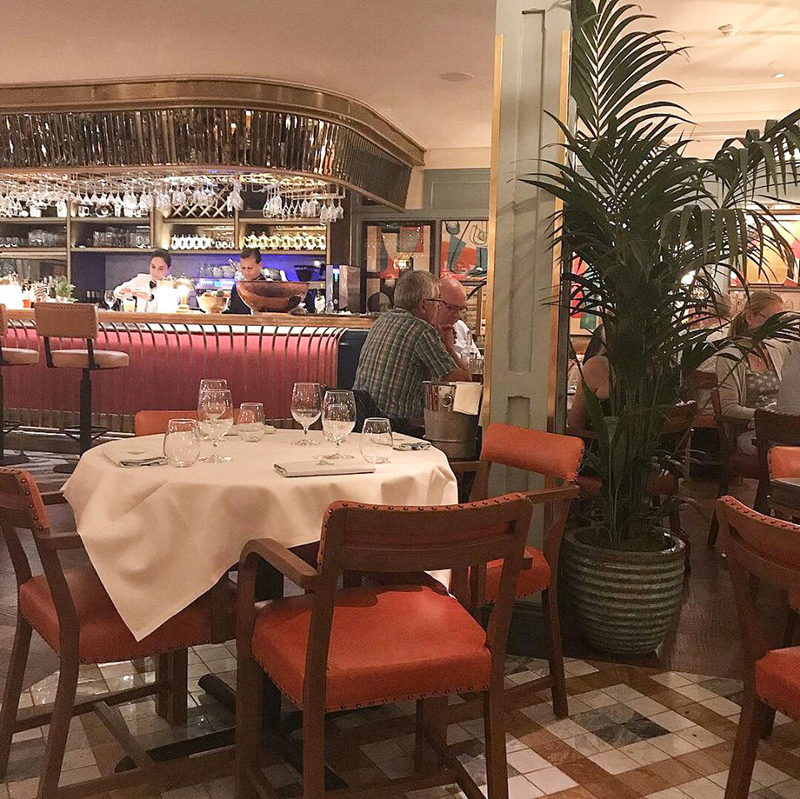 The small booths around the outer of the restaurant provide a 1920's style influence and the inner tables aren't pushed too close together, as that's a pet peeve of mine in some restaurants! We were seated at our booth, then served some of the most incredible Sourdough bread, topped with salt melted into the crown and served with creamy butter. Honestly it's enough to make you not even want to order anything else..... But alas, we did (of course). We enjoyed two of their finest drinks, the Peach and Elderflower tea and the English Spritz cocktail. For starters we wanted to order the Salmon and the Asparagus started but they weren't available so we had to choose again! (sad face). 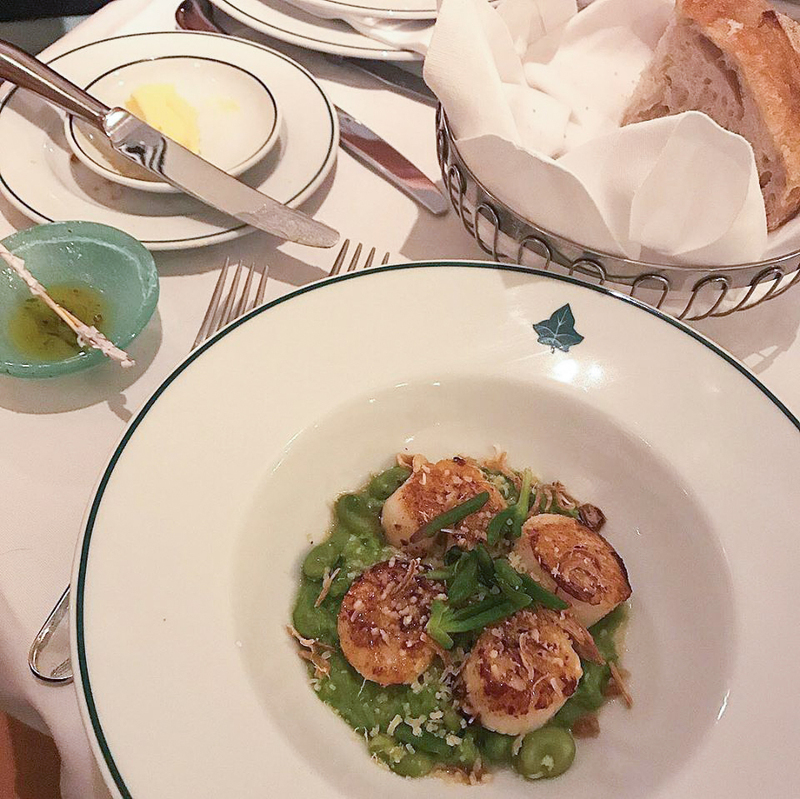 For starters, I went for the Atlantic sea scallops with Pea purée with broad beans, lemon zest, sea cress and crispy shallots. The mix of flavours was so rich and the textures went together so will, with the slight crunch of the shallots. 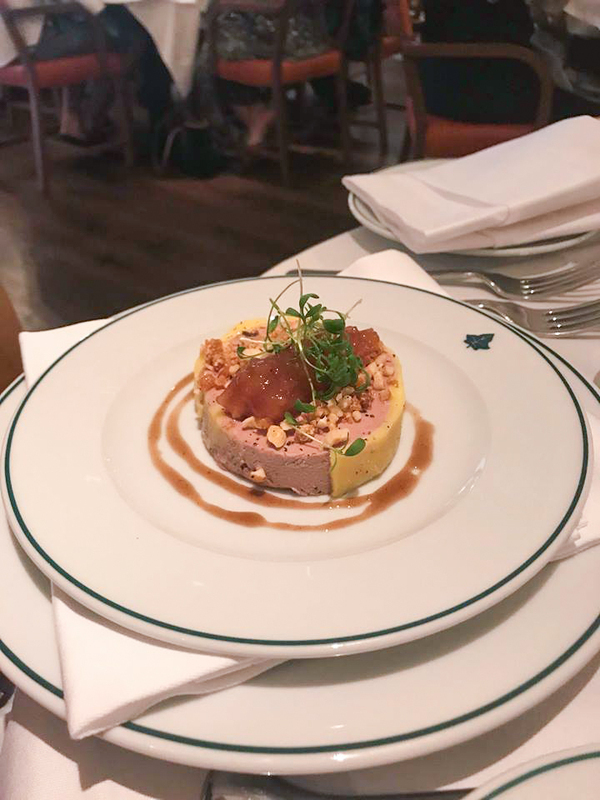 My friend went for the Duck liver parfait, with Caramelised hazelnuts, truffle, tamarind glaze with pear and ginger compote, toasted brioche. Not for me and I didn't try that one but she said it was amazing and full of flavour! We then began our bottle of white wine (I wouldn't have a clue what it was as I'm not great with wine names but trust me their wine menu will have something for you) and we chose one of the recommended bottles from the manager. We then moved onto the mains, eve though we were pretty full by this point after demolishing the bread but we powered through! I had the Slow-roasted lamb shoulder with Mustard and herb crust with creamed potato, garlic, spring vegetables and a rosemary sauce, and I can honestly tell you it has to be some of the best meat I have ever had. The Lamb was just cooked perfectly and the creamy potato went so well with it. The gravy that went with it also gave it another element of flavour, so I can't praise it enough. The other dish on the table was the Fillet Steak 7oz/198g that was a succulent prime centre cut, grass-fed English fillet, with a side of Truffle and Parmesan Chips. The Steak was cooked exactly to how she wanted it and it smelt divine. A few of the truffle chips also ended up on my plate ...... but shh don't tell her! We eventually passed on dessert because we were so full we practically rolled back into the chauffeur car and slept the whole way home, but honestly it was all so worth it. The service was pretty good, the atmosphere was so perfect and the food really did just impress us both to an unparalleled level. Thankyou to the Ivy and all their staff for such a wonderful evening! The meal was gifted for the purpose of this review but all opinions are my own.